Lutheran worship is a very structured and orderly thing. There are moments to stand, kneel, or sit, all of which are specifically laid out in the worship bulletin. We have elements like the kyrie, the gloria in excelsis, and the nunc dimittis in our services, and while we might not know exactly how those words translate into English, we probably have the lyrics memorized, and can sing them with multiple harmonies. Vestments and paraments are color coded to match the liturgical calendar, and the readings for any given Sunday are determined years in advance. We can easily pick out visitors during the responsive readings, as they have yet to master the “Lutheran cadence” that can only be developed after years of attendance. Now, I love the Lutheran liturgy. There is something very cool about using the same words in the same order along with other Christians around the world and through the centuries. The fact that the very structure of the service, and not just the homily, proclaims the Gospel is something that I have grown to appreciate more and more with each passing year. That said, a little chaos now and then is good for the soul. Perhaps this is why I so enjoy the Sundays where we have a children’s sermon in the middle of the service. It’s five minutes of pure improv in the midst of a tightly wound, highly organized program. There are many different ways to describe baptism. It is a cleansing and forgiveness of sin. It is an imparting of the Holy Spirit. 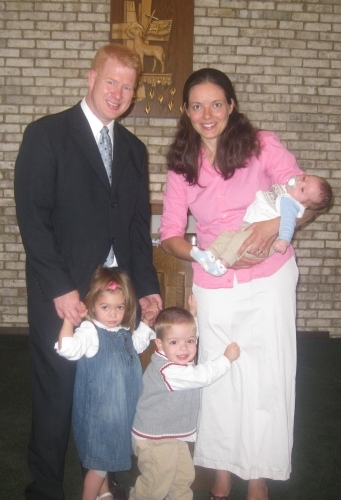 It is adoption as God’s child, and initiation into the one holy and apostolic Church. It is the drowning of the “Old Adam,” and the promise of a new life lived in Christ. Baptism is all of these things, and more. Thank you to all of you who were able to come out and join us on this blessed occasion. For those of you who were unable to join us, here are a few photos. The following post was written in February 2011. As I type, Beth and I are about three weeks out from meeting our third child. 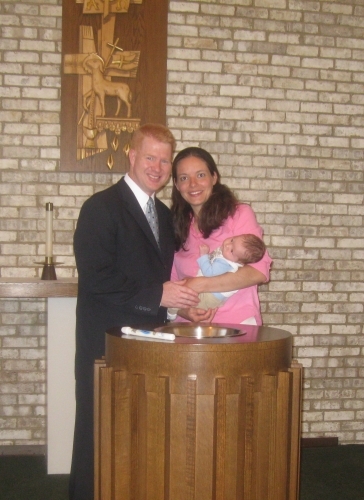 Rest assured, Children of the Heavenly Father will be sung at his baptism, and yes, I will probably cry again. One of the lasting memories of my childhood was seeing my mother cry in church. This was not for anything my brothers or I did, mind you (although I’m sure such moments did occur), but because of one particular melody that had (and has) the unique ability to turn an unflappable mother of four boys into a blubbering puddle of tears. Safely in his bosom gather. It didn’t help matters that the song is one of the most omnipresent in all of Lutheran hymnody. Even Martin Luther’s A Mighty Fortress Is Our God isn’t as oft-repeated as this simple Swedish folk tune. While Luther’s “battle hymn” is largely reserved for festival days like Reformation Sunday, Children of the Heavenly Father is used to mark every major milestone in a congregant’s life. Be it baptism, confirmation, marriage, funeral—it is understood that such celebrations of life or remembrances of life past are to be accompanied by the hymn. 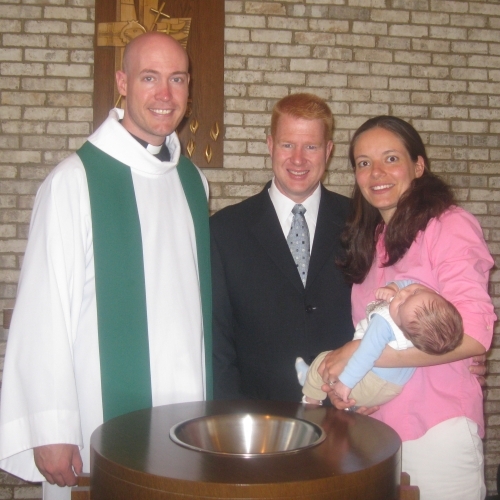 At our church, Children of the Heavenly Father was the official hymn sung at every baptism. 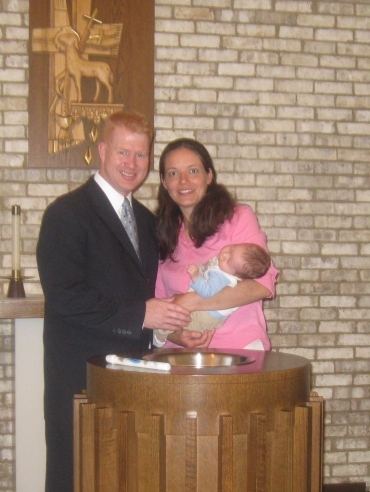 And living in a growing suburban neighborhood, we had a lot of baptisms. 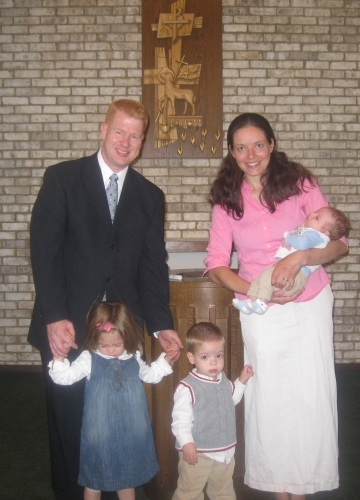 When opening the bulletin, we recognized the hymn on sight (hymn number 474 in the old Lutheran Book of Worship), and would take no small joy in pointing it out to mom before the service started. She would always vow that she wasn’t going to cry this time, but before the first verse was completed, there were always tears streaming down her face. Dad kept a handkerchief in his church suit pocket, just in case there was a baptism scheduled for that Sunday. The following post is adapted from an earlier version originally appearing on the Prison Fellowship weblog (a/k/a: my day job). Give it a look! While most “grown-ups” would avoid such argumentation, recent research would indicate that the desire to be graded on a sliding scale is deeply entrenched. Brooks references a new book by researcher Dan Ariely, entitled The Honest Truth about Dishonesty. The book describes a number of experiments taken to test its subjects’ honesty. In one test, Ariely placed cans of cola and plates of dollar bills in the common kitchens in college dormitories. Students typically walked away with the sodas, but left the dollar bills. His conclusion: students chose the soda over the money because taking the dollar bills felt too much like stealing. In another test, Ariely had two colleagues – one sighted, one blind – take identical cab rides. The cab drivers proved to be willing to take the “long route” with the sighted passenger, even though he would have been much more likely to detect the unnecessary distance. Presumably, cheating the blind passenger would have made the drivers feel guilty. Cheating the passenger who was not visually impaired? Less so.